This article is about the Elizabethan naval commander. For other uses, see Francis Drake (disambiguation). Sir Francis Drake (c. 1540 – 28 January 1596) was an English sea captain, privateer, slave trader, naval officer and explorer of the Elizabethan era. Drake carried out the second circumnavigation of the world in a single expedition, from 1577 to 1580, and was the first to complete the voyage as captain while leading the expedition throughout the entire circumnavigation. With his incursion into the Pacific Ocean, he claimed what is now California for the English and inaugurated an era of conflict with the Spanish on the western coast of the Americas, an area that had previously been largely unexplored by western shipping. Elizabeth I awarded Drake a knighthood in 1581 which he received on the Golden Hind in Deptford. As a Vice Admiral, he was second-in-command of the English fleet in the battle against the Spanish Armada in 1588. He died of dysentery in January 1596, after unsuccessfully attacking San Juan, Puerto Rico. Drake's exploits made him a hero to the English, but his privateering led the Spanish to brand him a pirate, known to them as El Draque. King Philip II allegedly offered a reward for his capture or death of 20,000 ducats, about £6 million (US$8 million) in modern currency. 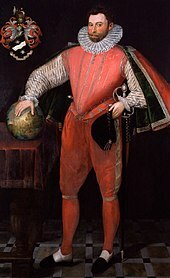 Francis Drake was born in Tavistock, Devon, England. Although his birth date is not formally recorded, it is known that he was born while the Six Articles were in force. His birth date is estimated from contemporary sources such as: "Drake was two and twenty when he obtained the command of the Judith" (1566). This would date his birth to 1544. A date of c.1540 is suggested from two portraits: one a miniature painted by Nicholas Hilliard in 1581 when he was allegedly 42, so born circa 1539, while the other, painted in 1594 when he was said to be 53, would give a birth year of around 1541. He was the oldest of the twelve sons of Edmund Drake (1518–1585), a Protestant farmer, and his wife Mary Mylwaye. The first son was alleged to have been named after his godfather Francis Russell, 2nd Earl of Bedford. Francis Drake married Mary Newman at St. Budeaux church, Plymouth, in July 1569. She died 12 years later, in 1581. In 1585, Drake married Elizabeth Sydenham—born circa 1562, the only child of Sir George Sydenham, of Combe Sydenham, who was the High Sheriff of Somerset. After Drake's death, the widow Elizabeth eventually married Sir William Courtenay of Powderham. At the age of eighteen he was purser of a ship which sailed to the Bay of Biscay. At twenty he made a voyage to the coast of Guinea. In 1563, Drake, aged 23, made his first voyage to the Americas, sailing with his second cousin, Sir John Hawkins, on one of a fleet of ships owned by his relatives, the Hawkins family of Plymouth. He made three voyages with this fleet, attacking Portuguese towns and ships on the coast of West Africa. They then sailed to the Americas and sold the captured cargoes of slaves to Spanish plantations. John Hawkins is considered to have been the first English slave-trader. Hawkins made three such expeditions, the first in 1563, second in 1564 and the third expedition ending in the ill-fated 1568 incident at San Juan de Ulúa. In 1568, Drake was on his third expedition with the Hawkins fleet when, whilst negotiating to resupply and repair at a Spanish port in Mexico, the fleet was attacked by Spanish warships, with all but two of the English ships lost. He escaped along with John Hawkins, surviving the attack by swimming. Drake's hostility towards the Spanish is said to have started with this incident. Following the defeat at San Juan de Ulúa, Drake vowed revenge. In 1570, his reputation enabled him to proceed to the West Indies with two vessels under his command. He renewed his visit the next year for the sole purpose of obtaining information. In 1572, he embarked on his first major independent enterprise. He planned an attack on the Isthmus of Panama, known to the Spanish as Tierra Firme and the English as the Spanish Main. This was the point at which the silver and gold treasure of Peru had to be landed and sent overland to the Caribbean Sea, where galleons from Spain would pick it up at the town of Nombre de Dios. Drake left Plymouth on 24 May 1572, with a crew of 73 men in two small vessels, the Pascha (70 tons) and the Swan (25 tons), to capture Nombre de Dios. His first raid was late in July 1572. Drake and his men captured the town and its treasure. When his men noticed that Drake was bleeding profusely from a wound, they insisted on withdrawing to save his life and left the treasure. Drake stayed in the area for almost a year, raiding Spanish shipping and attempting to capture a treasure shipment. The people of quality dislike him for having risen so high from such a lowly family; the rest say he is the main cause of wars. The most celebrated of Drake's adventures along the Spanish Main was his capture of the Spanish Silver Train at Nombre de Dios in March 1573. He raided the waters around Darien (in modern Panama) with a crew including many French privateers including Guillaume Le Testu, a French buccaneer, and African slaves (Maroons) who had escaped the Spanish. Drake tracked the Silver Train to the nearby port of Nombre de Dios. After their attack on the richly laden mule train, Drake and his party found that they had captured around 20 tons of silver and gold. They buried much of the treasure, as it was too much for their party to carry, and made off with a fortune in gold. (An account of this may have given rise to subsequent stories of pirates and buried treasure.) Wounded, Le Testu was captured and later beheaded. The small band of adventurers dragged as much gold and silver as they could carry back across some 18 miles of jungle-covered mountains to where they had left the raiding boats. When they got to the coast, the boats were gone. Drake and his men, downhearted, exhausted and hungry, had nowhere to go and the Spanish were not far behind. At this point, Drake rallied his men, buried the treasure on the beach, and built a raft to sail with two volunteers ten miles along the surf-lashed coast to where they had left the flagship. When Drake finally reached its deck, his men were alarmed at his bedraggled appearance. Fearing the worst, they asked him how the raid had gone. Drake could not resist a joke and teased them by looking downhearted. Then he laughed, pulled a necklace of Spanish gold from around his neck and said "Our voyage is made, lads!" By 9 August 1573, he had returned to Plymouth. It was during this expedition that he climbed a high tree in the central mountains of the Isthmus of Panama and thus became the first Englishman to see the Pacific Ocean. He remarked as he saw it that he hoped one day an Englishman would be able to sail it—which he would do years later as part of his circumnavigation of the world. When Drake returned to Plymouth after the raids, the government signed a temporary truce with King Philip II of Spain and so was unable to acknowledge Drake's accomplishment officially. Drake was considered a hero in England and a pirate in Spain for his raids. A map of Drake's route around the world. The northern limit of Drake's exploration of the Pacific coast of North America is still in dispute. Drake's Bay is south of Cape Mendocino. 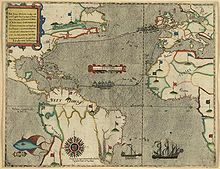 With the success of the Panama isthmus raid in 1577, Elizabeth I of England sent Drake to start an expedition against the Spanish along the Pacific coast of the Americas. Drake used the plans that Sir Richard Grenville had received the patent for in 1574 from Elizabeth, which was rescinded a year later after protests from Philip of Spain. He set out from Plymouth on 15 November 1577, but bad weather threatened him and his fleet. They were forced to take refuge in Falmouth, Cornwall, from where they returned to Plymouth for repair. After this major setback, Drake set sail again on 13 December aboard Pelican with four other ships and 164 men. He soon added a sixth ship, Mary (formerly Santa Maria), a Portuguese merchant ship that had been captured off the coast of Africa near the Cape Verde Islands. He also added its captain, Nuno da Silva, a man with considerable experience navigating in South American waters. Drake's fleet suffered great attrition; he scuttled both Christopher and the flyboat Swan due to loss of men on the Atlantic crossing. He made landfall at the gloomy bay of San Julian, in what is now Argentina. Ferdinand Magellan had called here half a century earlier, where he put to death some mutineers. Drake's men saw weathered and bleached skeletons on the grim Spanish gibbets. Following Magellan's example, Drake tried and executed his own "mutineer" Thomas Doughty. The crew discovered that Mary had rotting timbers, so they burned the ship. Drake decided to remain the winter in San Julian before attempting the Strait of Magellan. And after this holy repast, they dined also at the same table together, as cheerfully, in sobriety, as ever in their lives they had done aforetime, each cheering up the other, and taking their leave, by drinking each to other, as if some journey only had been in hand. Drake had Thomas Doughty beheaded on 2 July 1578. 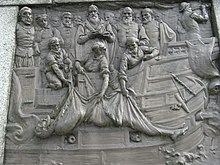 When the ship's chaplain Francis Fletcher in a sermon suggested that the woes of the voyage in January 1580 were connected to the unjust demise of Doughty, Drake chained the clergyman to a hatch cover and pronounced him excommunicated. The three remaining ships of his convoy departed for the Magellan Strait at the southern tip of South America. A few weeks later (September 1578) Drake made it to the Pacific, but violent storms destroyed one of the three ships, the Marigold (captained by John Thomas) in the strait and caused another, the Elizabeth captained by John Wynter, to return to England, leaving only the Pelican. After this passage, the Pelican was pushed south and discovered an island that Drake called Elizabeth Island. Drake, like navigators before him, probably reached a latitude of 55°S (according to astronomical data quoted in Hakluyt's The Principall Navigations, Voiages and Discoveries of the English Nation of 1589) along the Chilean coast. In the Magellan Strait Francis and his men engaged in skirmish with local indigenous people, becoming the first Europeans to kill indigenous peoples in southern Patagonia. During the stay in the strait, crew members discovered that an infusion made of the bark of Drimys winteri could be used as remedy against scurvy. Captain Wynter ordered the collection of great amounts of bark – hence the scientific name. Despite popular lore, it seems unlikely that Drake reached Cape Horn or the eponymous Drake Passage, because his descriptions do not fit the first and his shipmates denied having seen an open sea. The first report of his discovery of an open channel south of Tierra del Fuego was written after the 1618 publication of the voyage of Willem Schouten and Jacob le Maire around Cape Horn in 1616. Drake pushed onwards in his lone flagship, now renamed the Golden Hind in honour of Sir Christopher Hatton (after his coat of arms). The Golden Hind sailed north along the Pacific coast of South America, attacking Spanish ports and pillaging towns. Some Spanish ships were captured, and Drake used their more accurate charts. Before reaching the coast of Peru, Drake visited Mocha Island, where he was seriously injured by hostile Mapuche. Later he sacked the port of Valparaíso further north in Chile, where he also captured a ship full of Chilean wine. Near Lima, Drake captured a Spanish ship laden with 25,000 pesos of Peruvian gold, amounting in value to 37,000 ducats of Spanish money (about £7m by modern standards). Drake also discovered news of another ship, Nuestra Señora de la Concepción, which was sailing west towards Manila. It would come to be called the Cacafuego. Drake gave chase and eventually captured the treasure ship, which proved his most profitable capture. Aboard Nuestra Señora de la Concepción, Drake found 80 lb (36 kg) of gold, a golden crucifix, jewels, 13 chests full of royals of plate and 26 tons of silver. Drake was naturally pleased at his good luck in capturing the galleon, and he showed it by dining with the captured ship's officers and gentleman passengers. He offloaded his captives a short time later, and gave each one gifts appropriate to their rank, as well as a letter of safe conduct. After looting the Cacafuego, Drake turned north, hoping to meet another Spanish treasure ship coming south on its return from Manila to Acapulco. Although he failed to find a treasure ship, Drake reputedly sailed as far north as the 38th parallel, landing on the coast of California on 17 June 1579. He found a good port, landed, repaired and restocked his vessels, then stayed for a time, keeping friendly relations with the Coast Miwok natives. He claimed the land in the name of the Holy Trinity for the English Crown, called Nova Albion—Latin for "New Britain". Assertions that he left some of his men behind as an embryo "colony" are founded on the reduced number who were with him in the Moluccas. The precise location of the port was carefully guarded to keep it secret from the Spaniards, and several of Drake's maps may have been altered to this end. All first-hand records from the voyage, including logs, paintings and charts, were lost when Whitehall Palace burned in 1698. A bronze plaque inscribed with Drake's claim to the new lands – Drake's Plate of Brass – fitting the description in his account, was discovered in Marin County, California but was later declared a hoax. Now a National Historic Landmark, the officially recognised location of Drake's New Albion is Drakes Bay, California. Drake left the Pacific coast, heading southwest to catch the winds that would carry his ship across the Pacific, and a few months later reached the Moluccas, a group of islands in the western Pacific, in eastern modern-day Indonesia. While there, Golden Hind became caught on a reef and was almost lost. After the sailors waited three days for convenient tides and had dumped cargo, they freed the barque. Befriending a sultan king of the Moluccas, Drake and his men became involved in some intrigues with the Portuguese there. He made multiple stops on his way toward the tip of Africa, eventually rounded the Cape of Good Hope, and reached Sierra Leone by 22 July 1580. On 26 September, Golden Hind sailed into Plymouth with Drake and 59 remaining crew aboard, along with a rich cargo of spices and captured Spanish treasures. The Queen's half-share of the cargo surpassed the rest of the crown's income for that entire year. Drake was hailed as the first Englishman to circumnavigate the Earth (and the second such voyage arriving with at least one ship intact, after Elcano's in 1520). The Queen declared that all written accounts of Drake's voyages were to become the Queen's secrets of the Realm, and Drake and the other participants of his voyages on the pain of death sworn to their secrecy; she intended to keep Drake's activities away from the eyes of rival Spain. Drake presented the Queen with a jewel token commemorating the circumnavigation. Taken as a prize off the Pacific coast of Mexico, it was made of enamelled gold and bore an African diamond and a ship with an ebony hull. For her part, the Queen gave Drake a jewel with her portrait, an unusual gift to bestow upon a commoner, and one that Drake sported proudly in his 1591 portrait by Marcus Gheeraerts now at the National Maritime Museum, Greenwich. On one side is a state portrait of Elizabeth by the miniaturist Nicholas Hilliard, on the other a sardonyx cameo of double portrait busts, a regal woman and an African male. The "Drake Jewel", as it is known today, is a rare documented survivor among sixteenth-century jewels; it is conserved at the Victoria and Albert Museum, London. Drake receives his knighthood from Queen Elizabeth I. Bronze plaque by Joseph Boehm, 1883, base of Drake statue, Tavistock. Sir Francis Drake with his new heraldic achievement, with motto: Sic Parvis Magna, translated literally: "Thus great things from small things (come)". The hand out of the clouds is labelled Auxilio Divino, or "With Divine Help"
Queen Elizabeth awarded Drake a knighthood aboard Golden Hind in Deptford on 4 April 1581; the dubbing being performed by a French diplomat, Monsieur de Marchaumont, who was negotiating for Elizabeth to marry the King of France's brother, Francis, Duke of Anjou. By getting the French diplomat involved in the knighting, Elizabeth was gaining the implicit political support of the French for Drake's actions. During the Victorian era, in a spirit of nationalism, the story was promoted that Elizabeth I had done the knighting. Sable a fess wavy between two pole-stars [Arctic and Antarctic] argent; and for his crest, a ship on a globe under ruff, held by a cable with a hand out of the clouds; over it this motto, Auxilio Divino; underneath, Sic Parvis Magna; in the rigging whereof is hung up by the heels a wivern, gules, which was the arms of Sir Bernard Drake. Nevertheless, Drake continued to quarter his new arms with the wyvern gules. The arms adopted by his nephew Sir Francis Drake, 1st Baronet (1588–1637) of Buckland were the arms of Drake of Ash, but the wyvern without a "nowed" (knotted) tail. Drake was politically astute, and although known for his private and military endeavours, he was an influential figure in politics during the time he spent in Britain. Often abroad, there is little evidence to suggest he was active in Westminster, despite being a member of parliament on three occasions. After returning from his voyage of circumnavigation, Drake became the Mayor of Plymouth, in September 1581. He became a member of parliament during a session of the 4th Parliament of Elizabeth I, on 16 January 1581, for the constituency of Camelford. He did not actively participate at this point, and on 17 February 1581 he was granted leave of absence "for certain his necessary business in the service of her Majesty". Drake became a member of parliament again in 1584 for Bossiney on the forming of the 5th Parliament of Elizabeth I. He served the duration of the parliament and was active in issues regarding the navy, fishing, early American colonisation, and issues related chiefly to Devon. He spent the time covered by the next two parliamentary terms engaged in other duties and an expedition to Portugal. He became a member of parliament for Plymouth in 1593. He was active in issues of interest to Plymouth as a whole, but also to emphasize defence against the Spanish. In 1580, Drake purchased Buckland Abbey, a large manor house near Yelverton in Devon, via intermediaries from Sir Richard Greynvile. He lived there for fifteen years, until his final voyage, and it remained in his family for several generations. Buckland Abbey is now in the care of the National Trust and a number of mementos of his life are displayed there. War had already been declared by Phillip II after the Treaty of Nonsuch, so the Queen through Francis Walsingham ordered Sir Francis Drake to lead an expedition to attack the Spanish colonies in a kind of preemptive strike. An expedition left Plymouth in September 1585 with Drake in command of twenty-one ships with 1,800 soldiers under Christopher Carleill. He first attacked Vigo in Spain and held the place for two weeks ransoming supplies. He then plundered Santiago in the Cape Verde islands after which the fleet then sailed across the Atlantic, sacked the port of Santo Domingo, and captured the city of Cartagena de Indias in present-day Colombia. On 6 June 1586, during the return leg of the voyage, he raided the Spanish fort of San Augustín in Spanish Florida. After the raids he then went on to find Sir Walter Raleigh's settlement much further north at Roanoke which he replenished and also took back with him all of the original colonists before Sir Richard Greynvile arrived with supplies and more colonists. He finally reached England on 22 July, when he sailed into Portsmouth, England to a hero's welcome. Angered by these acts, Philip II ordered a planned invasion of England. In another pre-emptive strike, Drake "singed the beard of the King of Spain" in 1587 by sailing a fleet into Cadiz and also Corunna, two of Spain's main ports, and occupied the harbours. He destroyed 37 naval and merchant ships. The attack delayed the Spanish invasion by a year. Over the next month, Drake patrolled the Iberian coasts between Lisbon and Cape St. Vincent, intercepting and destroying ships on the Spanish supply lines. Drake estimated that he captured around 1600–1700 tons of barrel staves, enough to make 25,000 to 30,000 barrels (4,800 m3) for containing provisions. Drake was vice admiral in command of the English fleet (under Lord Howard of Effingham,) when it overcame the Spanish Armada that was attempting to invade England in 1588. As the English fleet pursued the Armada up the English Channel in closing darkness, Drake broke off and captured the Spanish galleon Rosario, along with Admiral Pedro de Valdés and all his crew. The Spanish ship was known to be carrying substantial funds to pay the Spanish Army in the Low Countries. Drake's ship had been leading the English pursuit of the Armada by means of a lantern. By extinguishing this for the capture, Drake put the fleet into disarray overnight. Coming up to them, there has passed some common shot between some of our fleet and some of them; and as far as we perceive, they are determined to sell their lives with blows. The most famous (but probably apocryphal) anecdote about Drake relates that, prior to the battle, he was playing a game of bowls on Plymouth Hoe. On being warned of the approach of the Spanish fleet, Drake is said to have remarked that there was plenty of time to finish the game and still beat the Spaniards. There is no known eyewitness account of this incident and the earliest retelling of it was printed 37 years later. Adverse winds and currents caused some delay in the launching of the English fleet as the Spanish drew nearer, perhaps prompting a popular myth of Drake's cavalier attitude to the Spanish threat. It might also have been later ascribed to the stoic attribute of British culture. In 1589, the year after defeating the Armada, Drake and Sir John Norreys were given three tasks: seek out and destroy the remaining ships, support the rebels in Lisbon, Portugal against King Philip II (then king of Spain and Portugal), and take the Azores if possible. Drake and Norreys destroyed a few ships in the harbour of A Coruña in Spain but lost more than 12,000 lives and 20 ships. This delayed Drake, and he was forced to forgo hunting the rest of the surviving ships and head on to Lisbon. Drake's burial at sea off Portobello. Bronze plaque by Joseph Boehm, 1883, base of Drake statue, Tavistock. Drake's seafaring career continued into his mid-fifties. In 1595, he failed to conquer the port of Las Palmas, and following a disastrous campaign against Spanish America, where he suffered a number of defeats, he unsuccessfully attacked San Juan de Puerto Rico, eventually losing the Battle of San Juan. The Spanish gunners from El Morro Castle shot a cannonball through the cabin of Drake's flagship, but he survived. He attempted to attack San Juan again, but a few weeks later, in January 1596, he died (aged about 56) of dysentery, a common disease in the tropics at the time, while anchored off the coast of Portobelo, Panama, where some Spanish treasure ships had sought shelter. Following his death, the English fleet withdrew. Before dying, he asked to be dressed in his full armour. He was buried at sea in a sealed lead-lined coffin, near Portobelo, a few miles off the coastline. It is supposed that his final resting place is near the wrecks of two British ships, the Elizabeth and the Delight, scuttled in Portobelo Bay. Divers continue to search for the coffin. Drake's body has never been recovered. This portrait, circa 1581, may have been copied from Hilliard's miniature—note the similar shirt—and the somewhat oddly-proportioned body, added by an artist who did not have access to Drake. National Portrait Gallery, London. In the UK there are various places named after him, especially in Plymouth, Devon. Places there carrying his name include the naval base (HMS Drake), Drake's Island and a shopping centre and roundabout named Drake Circus. Plymouth Hoe is also home to a statue of Drake. In the United States Drakes Bay and Sir Francis Drake Boulevard of Marin County, California are both named after him, as well as the high school in San Anselmo, California. The boulevard runs between Drakes Bay at Point Reyes to Point San Quentin on San Francisco Bay. A large hotel in Union Square, San Francisco also bears his name. Additionally, the Sir Francis Drake Channel in the British Virgin Islands bears his name. In British Columbia, Canada, where some theorize he may also have landed to the north of the usual site considered to be Nova Albion, various mountains were named in the 1930s for him, or in connection with Elizabeth I or other figures of that era, including Mount Sir Francis Drake, Mount Queen Bess, and the Golden Hinde, the highest mountain on Vancouver Island. Drake's will was the focus of a vast confidence scheme which Oscar Hartzell perpetrated in the 1920s and 1930s. He convinced thousands of people, mostly in the American Midwest, that Drake's fortune was being held by the British government, and had compounded to a huge amount. If their last name was Drake they might be eligible for a share if they paid Hartzell to be their agent. The swindle continued until a copy of Drake's will was brought to Hartzell's mail fraud trial and he was convicted and imprisoned. Drake's Drum has become an icon of English folklore with its variation of the classic king in the mountain story. Drake was a major focus in the video game Uncharted: Drake's Fortune where the main character, a supposed descendant of Drake, searches for El Dorado treasure. ^ Woolsey, Matt (19 September 2008). "Top-Earning Pirates". Forbes.com. Forbes Magazine. Retrieved 5 February 2013. ^ Paris Profiles. Bibliothéque Nationale, Paris. pp. Portfolio 17. ^ Helen Wallis (1984). "The Catography of Drake's Voyage". In Norman J. W. Thrower (ed.). Sir Francis Drake and the Famous Voyage, 1577-1580: Essays Commemorating the Quadricentennial of Drake's Circumnavigation of the Earth. University of California Press. p. 143. ISBN 978-0-520-04876-8. ^ Soto Rodríguez, José Antonio (2006). "La defensa hispana del Reino de Chile" (PDF). Tiempo y Espacio (in Spanish). 16. Retrieved 30 January 2016. ^ According to the English calendar then in use, Drake's date of death was 28 January 1595, as the new year began on 25 March. ^ His name in Latinised form was Franciscus Draco ("Francis the Dragon"). See Theodor de Bry. ^ John Cummins (1997). Francis Drake: The Lives of a Hero. St. Martin's Press. p. 126. ISBN 978-0-312-16365-5. ^ Mark G. Hanna (22 October 2015). Pirate Nests and the Rise of the British Empire, 1570-1740. UNC Press Books. p. 46. ISBN 978-1-4696-1795-4. ^ Campbell, John (1841). Lives of the British Admirals and Naval History of Great Britain from the Time of Caesar to the Chinese War of 1841 Chiefly Abridged from the work of Dr. John Campbell. Glasgow: Richard Griffin & Co. p. 104. ISBN 9780665347566. OCLC 12129656. Retrieved 30 August 2012. Direct quote is followed by "this carries back his birth to 1544, at which time the six articles were in force, and Francis Russell was seventeen years of age." ^ 1921/22 edition of the Dictionary of National Biography, which quotes Barrow's Life of Drake (1843) p. 5. ^ Froude, James Anthony, English Seamen in the Sixteenth Century, London, 1896. Quote: "He told Camden that he was of mean extraction. He meant merely that he was proud of his parents and made no idle pretensions to noble birth. His father was a tenant of the Earl of Bedford, and must have stood well with him, for Francis Russell, the heir of the earldom, was the boy's godfather." ^ Warren, Derrick (2005). Curious Somerset. Stroud: Sutton Publishing. pp. 90–91. ISBN 978-0-7509-4057-3. ^ "The Occupants of the ancient office of High Sheriff of Somerset". Tudor Court. Retrieved 30 March 2011. ^ a b James Mill. The History of British India. ^ Carl Ortwin Sauer (1975). Sixteenth Century North America: The Land and the People as Seen by the Europeans. University of California Press. p. 235. ISBN 978-0-520-02777-0. ^ N, A. "The National Archives" (PDF). National Archives Website. National Archives. Retrieved 28 August 2017. ^ "History of English Slave Trade". Ehr.oxfordjournals.org. doi:10.1093/ehr/cej026. Retrieved 25 February 2010. ^ Vicary, Tim. "Sir Francis Drake and the African Slaves". English Historical Fiction Authors. Retrieved 17 March 2018. ^ "England's first slave trader". bbc.co.uk. Retrieved 17 March 2018. ^ David Marley (2008). Wars of the Americas: A Chronology of Armed Conflict in the Western Hemisphere, 1492 to the Present. ABC-CLIO. pp. 103–104. ISBN 978-1-59884-100-8. ^ Angus Konstam (20 December 2011). The Great Expedition: Sir Francis Drake on the Spanish Main 1585–86. Bloomsbury Publishing. p. 29. ISBN 978-1-78096-233-7. ^ a b Coote, Stephen (2003). Drake: The Life and Legend of an Elizabethan Hero. New York: Saint Martin's Press. ISBN 0-312-34165-2. ^ a b Wagner, Henry R., Sir Francis Drake's Voyage Around the World: Its Aims and Achievements, Kessinger Publishing, LLC, 2006, ISBN 1-4286-2255-1. ^ a b Martinic, Mateo (1977). Historia del Estrecho de Magallanes (in Spanish). Santiago: Andrés Bello. pp. 67–68. ^ a b c Kelsey, Harry, Sir Francis Drake; The Queen's Pirate, Yale University Press, New Haven, 1998, ISBN 0-300-07182-5. ^ Cortés Olivares, Hernán F. "El origen, producción y comercio del pisco chileno, 1546–1931". Revista Universum (in Spanish). Scielo.cl. doi:10.4067/S0718-23762005000200005. Retrieved 25 October 2012. ^ Dismissed by John Cummins, Francis Drake: The Lives of a Hero (1997) p. 118: "In view of the prominence given in different versions to the crowning of Drake it would be odd if the establishment of a colony had gone unrecorded." ^ "Drake Navigator's Guild". Drakenavigatorsguild.org. 17 October 2012. Retrieved 25 October 2012. ^ a b c "The Drake Jewel". Oieahc.wm.edu. Retrieved 25 February 2010. ^ a b "Image details". National Trust Images. Retrieved 25 October 2012. ^ a b Moseley, Brian (26 February 2011) [11 March 2004]. "Sir Francis Drake (c1541-1596)". The Encyclopaedia of Plymouth History. Plymouthdata.info. Archived from the original on 1 April 2012. Retrieved 12 February 2015. ^ Hazard, Mary E. (August 2000). Elizabethan silent language. U of Nebraska Press. p. 251. ISBN 978-0-8032-2397-4. ^ Perry, Maria (1990). The Word of a Prince: A Life of Elizabeth I from Contemporary Documents. Boydell Press. p. 182. ISBN 978-0-85115-633-0. ^ Campbell, John (1828). The life of the celebrated Sir Francis Drake, the first english Circumnavigator: reprinted from The Biographia Britannica. London: Longman, Rees, Orme, Brown and Green. pp. 50–52. Retrieved 18 January 2013. ^ Drake, Charles E.F., The Arms of Sir Francis Drake Archived 19 May 2012 at the Wayback Machine, Quebec, 2008; Article by str8thinker, Project Avalon Forum, Dec 2010, based on article of Charles Drake, 2008, op. cit. ^ "1572". History of Parliament. Retrieved 28 July 2017. ^ a b c d Hasler, P W. "DRAKE, Francis". History of Parliament. The History of Parliament Trust. Retrieved 28 July 2017. ^ "1584". History of Parliament. Retrieved 28 July 2017. ^ Andrews, Evan (4 April 2016). "10 Things You May Not Know About Francis Drake". History. Retrieved 28 July 2017. ^ Thompson, E. and Freeman, E. A. History of England, p. 188. ^ a b "Kraus, Hans. Sir Francis Drake: A Pictorial Biography, 1970". Loc.gov. 13 October 2005. Retrieved 25 February 2010. ^ Letter to Admiral Henry Seymour written aboard Revenge on 31 July 1588 (21 July 1588 O.S.) Turner, Sharon. The History of England from the Earliest Period to the Death of Elizabeth, 1835. ^ "Sir Francis Drake". thepirateking.com. Retrieved 28 July 2017. 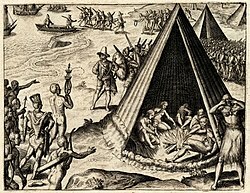 ^ "Sir Francis Drake's body 'close to being found off Panama'". BBC News. Retrieved 9 October 2013. ^ Henderson, Barney; Swaine, Jon (24 October 2011). "Sir Francis Drake's final fleet 'discovered off the coast of Panama'". Telegraph Newspaper. Retrieved 28 July 2017. ^ Rayner, Richard (22 April 2002). "The Admiral and the Con Man". The New Yorker. p. 150. Bawlf, Samuel (2003). The Secret Voyage of Sir Francis Drake, 1577–1580. Walker & Company. ISBN 0-8027-1405-6. Corbett, Julian Stafford (1890). Sir Francis Drake. Kelsey, Harry (1998). Sir Francis Drake, the Queen's Pirate. New Haven, Connecticut: Yale University Press. ISBN 0-300-07182-5. Mattingly, Garett (1959). The Defeat of the Spanish Armada. ISBN 0-395-08366-4. A detailed account of the defeat of the Spanish Armada which received a special citation from the Pulitzer Prize committee in 1960. Wilson, Derek (1977). The World Encompassed: Drake's Great Voyage, 1577–80. Harper & Row. ISBN 0-06-014679-6. Wikimedia Commons has media related to Francis Drake. Wikisource has the text of a 1920 Encyclopedia Americana article about Francis Drake. "Drake, Francis" . New International Encyclopedia. 1905. "Drake, Sir Francis" . Collier's New Encyclopedia. 1921.